Content warning: This article discusses sexual violence. The sixth annual installment of It Happens Here (IHH), an event that showcases narratives by survivors of sexual violence and assault, took place last night. Student speakers read 24 narratives throughout the program, which lasted for an hour and a half. The event was planned by Action for Sexual Assault Prevention (ASAP), a group of students working to bring awareness to sexual violence and assault on the Tufts campus in effort to create a culture of consent. Narratives took multiple forms, ranging from accounts of what happened to direct letters to perpetrators to poetry. The opening statements, given by ASAP executive board member Han Lee, expressed the event’s aims. “Our hope is that we will continue to center the voices of those who are best suited to discuss this problem: survivors. It is more important now than ever that we respect and support these brave individuals,” Lee, a junior, said. The event came together through the work of ASAP’s five-person executive board, made up by Lee, co-head of education and outreach; sophomore Benji Cole, head of Action for Sexual Assault Prevention by Tufts Men (ASAP™); junior Jennifer Kim, head of survivor spaces; and sophomores Paula GilOrdoñez Gomez and Malaika Gabra, co-heads of events. IHH’s overarching goal was to give validation and voice to the stories and feelings of survivors of sexual abuse and assault on campus, according to Kim. “It’s recognizing that it happens here and that a lot of people struggle with it day to day but don’t really get resources or recognition for it,” Kim said in an interview with the Daily. “And secondarily, I think it is also a way for survivors to kind of just tell their stories and get a sense of validation for what they go through and … [the] feeling like their story is worth sharing.” Narratives were read either by the survivors themselves or by volunteer readers. Submissions could be submitted anonymously or openly with the option of survivors reading their narratives themselves or having a volunteer read it for them. ed the event to provide solace and support for the survivors and anyone affected by their stories. Alexandra Donovan, director of the Center for Awareness, Resources and Education, and Walker Bristol, the Humanist chaplain, were also available to talk with students. The Women’s Center was open as a space for individuals to meet. 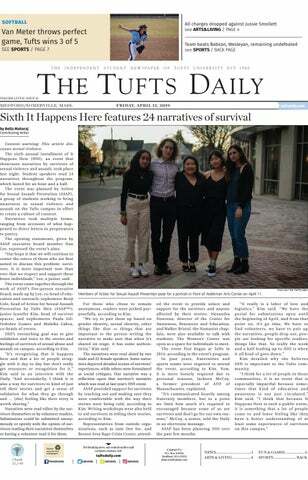 The event first began at Tufts in 2014, according to the event’s program. In past years, fraternities and sports teams were required to attend the event, according to Kim. Now, it is more loosely required due to personal reasons, Jackson McCoy, a former president of ATO of Massachusetts, explained. “It’s communicated heavily among fraternity members, but to a point we limit how much it’s required vs encouraged because some of us are survivors and don’t go for our own reasons,” McCoy, a senior, told the Daily in an electronic message. ASAP has been planning IHH over the past few months. Professor Jason Stanley of Yale University gives a presentation on ‘Ignorance in the Age of Information’ in the Crane Room of Paige Hall on April 11. A chapter of “How Fascism Works” is devoted to universities, and primarily deals with right-wing speakers on campus. Stanley addressed this in the interview, advocating for right-wing speakers in the right context. “It’s a political war,” Stanley said. “Genuine right-wing conservative speakers have a place on campus, an important place on campus, a voice to be heard, and there’s a lot of money for such speakers and a lot of support for them, and I’m glad they do speak. But when people speak just to provoke, to create fodder for the press that they can then use so the government can clamp down on universities in a authoritarian fashion, then I think we have a problem. It’s been planned from the beginning.” Stanley also discussed his new book and the subject of his lecture, “Ignorance in the Age of Information,” and the ways he is contributing to linguistic theory. “The talk is coming from my new book project with Princeton University Press, where I’m trying to bring together insights that I think humanities scholars know about language, that language is not just there for communication,” Stanley said. “So it’s a mixed science and humanities talk, where I’m going to be talking about how we should recognize that language has these multiple purposes, to create [us-vs.-them] distinctions, to divide, as well as to communicate.” Ava Dimond, a student in Pfeifer’s course who attended the event, said she enjoyed it. “I appreciate his commitment to exploring why people are attracted to fascism from many different angles, throughout history and in different places,” Dimond, a first-year, said. experts have suggested that the saga is far from over for Smollett, noting that the city would likely begin civil proceedings and that future criminal charges are not out of the question. Smollett’s team has countered with their own threats of legal action. Following the dismissal of charges, several outlets reported that the FBI would begin investigating the case. Donald Trump has also announced this with a tweet of his own. While it is unclear whether Smollett will return to “Empire,” Fox announced that they were “gratified” at the development. bly learned in the mechanics of television and are now able to think about a character’s arc and story plotting in ways that previous generations would not. Thanks to shows like “Breaking Bad”(2008–2013), the Sopranos (1999–2007), or even Game of Thrones (2011–2019), viewers of premium cable television have been imprinted with this idea on how the narrative arc affects the ending and how valuable that end is. Simply put, viewers of “Barry” are spending too much time worried about the end result, and not focusing on the entertaining journey in front of them. Ultimately, it seems like “Barry” is better off not listening to any of these concerns. Watching the start of the season it is clear how well constructed and thought out Barry the character is. The show is both still incredibly well directed and written. The first episode reveals depths of Barry’s character that were not visible before, and more complications arise for him that should make for entertaining television. Rather than asking what will be the end result for the main characters of “Barry,” viewers should spend more time enjoying the ride. K, I’m going to level with you all, I try not to base my weekly spotlight on what comic book movies are coming out this week. Usually I try and keep my reviews to books I think you should read on their own merits … but some weeks I indulge myself, and this is one of those weeks. With a rebooted “Hellboy” movie coming out the day this article is published, I want to dedicate this week to the “Hellboy Omnibus Volume 1: Seed of Destruction,” written by Mike Mignola and John Byrne. For the uninitiated, Hellboy is a supernatural detective with a knack for averting apocalyptic catastrophes, like the time Rasputin (yes, that Rasputin) tried to summon a giant tentacled beast to end the world. Oh, and our protagonist looks like a demon, complete with red skin, hooves, a tail and a pair of shaved horns that sit like goggles on his forehead. The first volume lives up to that insane premise with gusto, tracking some of Hellboy’s first adventures in the early 1990s. This being the first volume of a greater series, it also serves an ideal jumping on point, with the reader witnessing Hellboy’s arrival on Earth within just a few pages. After that, the book moves at a merciless pace, putting the reader through an adventure that introduces them to the Bureau for Paranormal Research and Defense, as well as Hellboy’s friends, Abe Sapien (a fish-human hybrid) and Liz Sherman (a woman with the ability to control fire). The first story, from which the omnibus takes the name “Seed of Destruction” also reveals the greatest threat in the Hellboy universe: The Ogdru Jahad, an ancient threat that would bring about the end of the world as we know it. As Mignola wears the hats of both writer and artist on the title, I feel obligated to say that his art is something else. No description of Mignola’s art would be complete without talking about his use of darkness to create the illusion of depth. Mignola’s pencil work and coloring paints objects in the foreground in color, but any object beyond what is directly in the panel’s center is usually shrouded in varying degrees of darkness. The effect is wholly unique, and it really plays up the horror roots of the book, making locations like a desolated church or an old mansion slowly sinking into a lake feel appropriately spine-tingling. The resulting images look like something straight off an old “Iron Maiden” album cover, certainly not your typical comic book fare. For any of you out there looking for something a little different than a typical superhero comic, but still craving some good action, I can’t recommend the first volume of “Hellboy Omnibus” nearly enough. Never diving fully into horror, while also never becoming too light or upbeat, the first volume sets up a saga that wouldn’t see its completion until 2016, and the foundations of the grand mythos of Hellboy are all here in volume one. Drew Weisberg is a first-year studying psychology and film and media studies. Drew can be reached at mitchell.weisberg@ tufts.edu. Domestic breakdowns could require your attention. Beautify the situation. Keep communicating. Choose what’s best for your family. Use your charm to soothe ruffled feathers. 8 –0 thra s hing o f the Po la r Bears. Even with a strong offensive out put, it was Van Meter who stole the show, going the distance and retiring ever y single batter she faced. The Jumbo defense made up for its disappointing effort in the morning game by steadying the starter Van Meter as she picked apart the helpless Bowdoin lineup. “Kristi [ Van Meter] is just a competitor and Saturday was just a day she was able to go out there and was in the zone and was able to compete really well,” Ebstein said. “She had some great defensive efforts behind her, and it’s always more fun to go out and pitch when the bats are putting up runs on offense.” The Amston, Conn. native, who now holds an 11–1 record on the year, said that facing Bowdoin the day before helped her location and her feel for the lineup, despite the strain it puts on the arm. “It’s certainly not easy, but we’ve been building to that since February,” Van Meter said. “You just start to learn tendencies after a while. A lot of pitchers don’t like seeing the same lineup too much, but for me it definitely helps.” In softball and baseball there is always an unspoken rule to not bring up a possible no-hitter or perfect game — it’s considered a serious jinx. For Van Meter, it was just about taking it batter by batter. “I knew since the second inning,” Van Meter said. “It was more just a mental thing of not getting in my own way.” The offense also made the feat easier by putting up five strong innings, with Lebinski leading the way with four RBIs and a home run. “The first thing I said to [the team] was ‘thank you for making that easier’ cause I only had to go five innings instead of seven,” Van Meter said. 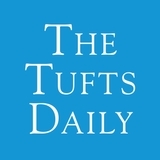 On Friday, Tufts beat Bowdoin 5–4 in the first edition of the three-day series. Sophomore Jamie Stevens was the hero, smacking a home run in the top of the seventh to set up her teams’ 18th win of the season. Meter got the win, going the distance and only allowing five hits. The game was a back and forth affair, presenting a glimpse of what appears to be a very competitive NESCAC softball division this season. Much of the Jumbos’ action of the season thus far was in Florida over spring break, where they put together an impressive 13-game win streak before falling in their finals two games. The three-game tie against Bowdoin is the second NESCAC team the Jumbos have faced this season after beating Bates three times to lead off their in-conference season. Tufts continues on in the NESCAC gauntlet this weekend, when they will face the Trinity Bantams. The first pitch is this evening at 4 p.m. at Trinity in Hartford, Conn.
apart against the versatility of the Jumbo attack. In the second half, the Jumbos went on to capitalize on two man-up opportunities among its seven goals. Sophomore attacker Catherine Lawliss clinched one of those chances, going on to be the game’s leading scorer with five goals and one assist. The game marked one of the only times this season that Tufts didn’t dominate the draw. The Beavers controlled 19 draws while Tufts controlled 16, and it was this edge that allowed the Beavers to clinch possessions that helped them score early in the game. In the end, Babson couldn’t contend with Tufts’ strength on the attack, nor the defensive pressure Tufts delivered. The lead established in the first half gave Tufts the chance to field its entire roster in the game, with many less-experienced players getting the opportunity to make their mark. The day before, the Jumbos faced similar draw control issues against the Cardinals, with their opponents outdrawing them 20–9. Tufts cycled several players including Baldwin, senior attacker Dakota Adamec and first-year attacker Colette Smith through the draw position to contend with the strength of Wesleyan’s draw taker. A tense first half marked the first time the Jumbos were ever down at halftime. The Cardinals edged them 7–5 thanks to a hat trick from powerhouse junior midfielder Abby Manning. After Tufts went up 2–0 early in the game thanks to two free-position goals, Wesleyan answered with five straight goals that forced Tufts to reorganize its defense. The team switched to its high-pressure defense, which is more tiring, but the switch paid off as the Jumbos put a cap on the Cardinals’ scoring before the half. “We didn’t start out as urgently as we wanted to,” Baldwin said. “We put a face guard on [senior midfielder Abigail Horst] because she had been scoring most of their goals, and we thought that cutting her off from the ball would keep them from scoring. But [Abby Manning] stepped up … After the five goals, we went into our high-pressure defense because that forced us to communicate and be more urgent in zones … That was a call that our defensive coach made that was one of the most important calls of the whole game.” Despite the deficit at halftime, Adamec was confident in the team’s ability to win, and she went on to run circles around the Wesleyan defenders, scoring seven goals of her eight total in the game. She matched her own record of most goals scored by a single player in a game, which she achieved against Hamilton in March 2018. Adamec strategically identified gaps in the Wesleyan defense that occurred when defenders tried to hand off players to mark other attackers on cuts. “I ran in circles around the crease two or three times to find the holes,” Adamec said. “In a backer defense the defenders will hand cutters off to each other, and once they communicate that they’re handing it off, they immediately turn their heads away. That connection is where their biggest hole was, so the moment they both turned their heads the middle was wide open: I just had to time my cut right.” Once the Cardinals picked up on this technique, they started to heavily mark Adamec. In fact, Adamec overheard one of the Wesleyan players yelling in the defensive huddle that “Number 27 is not getting the ball again!” after she netted her fourth goal. Unfortunately for the Cardinals, Adamec scored another four times. The defenders’ focus on Adamec paved the way for other attackers to find the openings instead. Seven straight goals by the Jumbos closed out the game, with junior attackers Emily Games and Maddie Norman, senior midfielder Annie Sullivan and Smith all finding the net in the final 17–10 win. The game was a test for Tufts players on both sides of the ball, as the defense continued to be tested throughout the game thanks to Wesleyan’s numerous possessions off the draw. In all, the defense forced 22 turnovers, and once the Jumbo offense started clicking, the team pulled away. “Their defense got very tired because a high pressure defense is very hard to play,” Adamec said. “In the last 10 minutes of the game, they were set, but they didn’t pressure out. I could hold the ball and not have to do anything with it because they were too tired to pressure me. At that point, we just worked the ball around to make them even more tired and find the holes.” Tufts’ dominant performance did not go unnoticed in the conference or national level. Games was named NESCAC Player of the Week on Monday after she tallied 13 points in three games. She was also named the Intercollegiate Women’s Lacrosse Coaches Association National Player of the Week for Div. III, an accolade that Adamec received two weeks ago. On Saturday, the Jumbos play again at home against the Amherst Mammoths (8–3, 4–3 NESCAC) who split a four-way tie for fourth place in the NESCAC. Last season Amherst tied for first place in the NESCAC and made a deep run to the quarterfinals of the NCAA tournament, and the Mammoths will look to be the first team to crack the Jumbos’ code. Tufts takes the draw against Amherst at 1 p.m. on Saturday on Bello Field.